The mockumentary-style book will recap episodes from the @TNG_S8 Twitter and add illustrations, trivia, set photos, and behind-the-scenes looks at the never-aired satirical eighth season. Since October 2011, the @TNG_S8 Twitter account has been providing TV Guide-style plot summaries for a satirical eighth season of Star Trek: The Next Generation. The exaggerated plots usually juxtapose a main mission for the crew with a subplot, producing hilarious new adventures for the crew of the Enterprise. Mike McMahan, the creator of the @TNG_S8 Twitter account, will bring the unaired season to life in an official mockumentary-style book. Star Trek: The Next Generation - Warped, An Engaging Guide to the Never-Aired 8th Season will present plot descriptions for each episode, trivia, aliens, set photos, and behind-the-scenes looks, illustrated by Joel Watson and Jason Ho. Watson is the creator of geek webcomic HijiNKS ENSUE, and Ho is an artist for Bongo Comics whose work includes the comic versions of The Simpsons and Futurama. Published by Gallery Books, Star Trek: The Next Generation - Warped, An Engaging Guide to the Never-Aired 8th Season is due out in paperback and ebook on March 3, 2015. McMahon told StarTrek.com, "I thought it would be fun to create an artifact from an alternate version of our universe: a tongue-in-cheek guide to the production of an -- admittedly silly -- season of TNG. I had a great time taking the tone of the jokes in @TNG_S8 and applying them to the expanded format of a guide, which gave me room for crazier episodes, dialogue, trivia, and plenty of Riker. I hope fans enjoy laughing with Geordi, Data, Worf and good old Barclay as much as I enjoyed writing their antics." 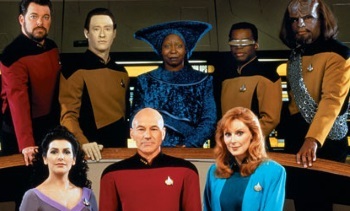 As a huge Star Trek fan, the @TNG_S8 Twitter is one of my favorite things on the Internet. I can't wait to see which Season 8 episodes McMahan puts in the book. If you've ever watched an episode of Next Generation, it's worth some time scrolling to read all of the ridiculous plots awaiting the crew of the Enterprise, and several gruesome fates for poor Lieutenant Barclay.